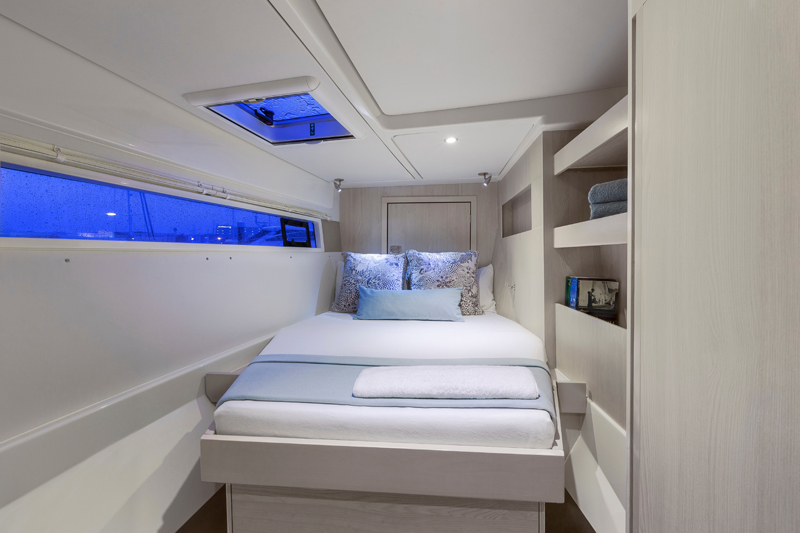 The result of a collaboration between The Moorings and yacht builders Robertson and Caine, the new Moorings 514PC follows in the footsteps of the popular Moorings 474PC, our best-selling Moorings Power model to date. 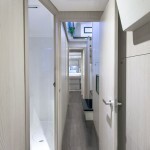 What sets the Moorings 514PC apart is not only its space, but also the introduction of a large forward cockpit accessed from the saloon—the first ever on a Moorings Power Catamaran. 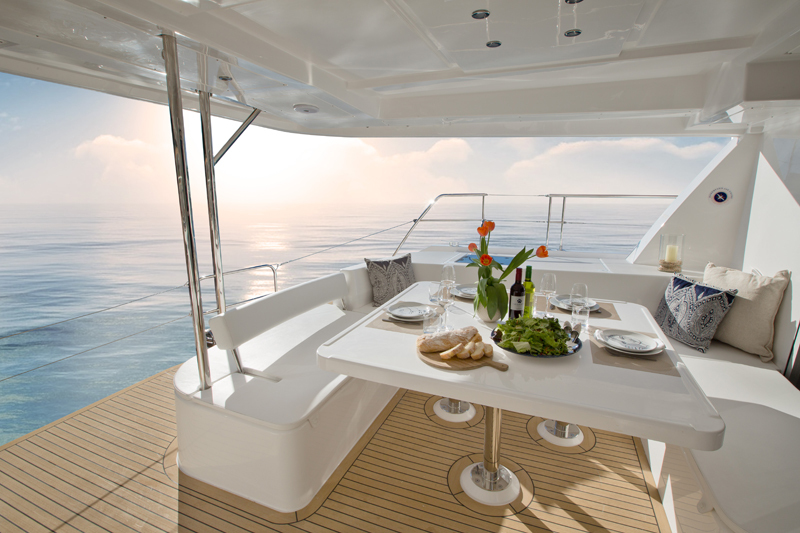 This space offers privacy when stern-tied at marinas, and is a respite from the late evening sun while at anchor. 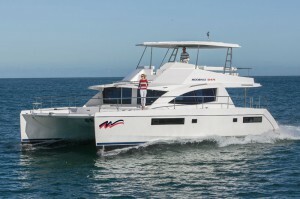 The Moorings 514 PC is a great example of R&C’s high quality construction and offers great performance from its twin 350 hp workhorse diesel engines. Up top, the fly bridge is almost double that of the M474PC. 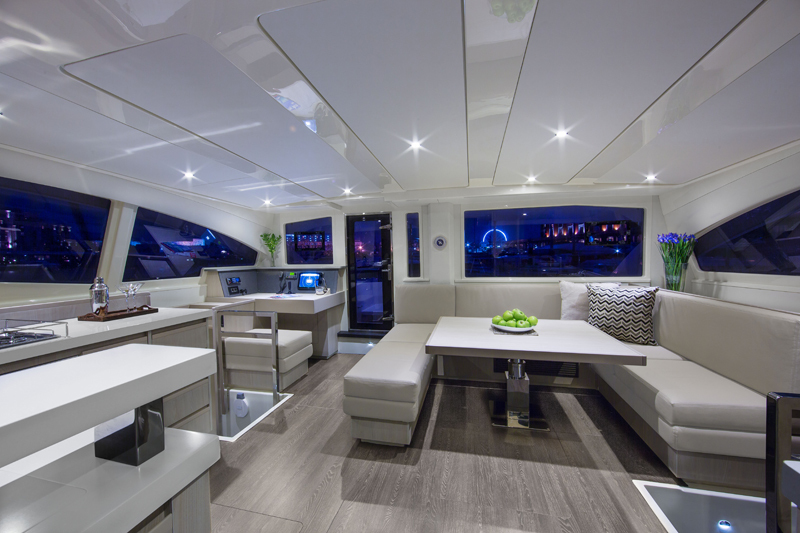 The fly bridge features a helm that is moved forward, large U-shaped seating to port with table, console with fridge, stainless steel grill and wet bar. 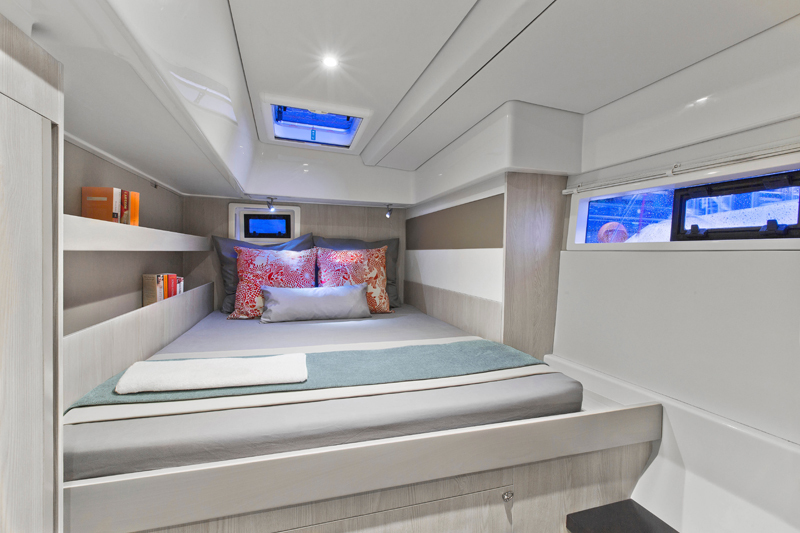 Adjacent to the helm is access to a forward lounging pad for the die-hard sun worshipers. 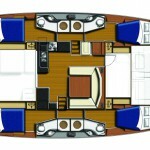 The main deck aft cockpit has seating for eight and ample storage. 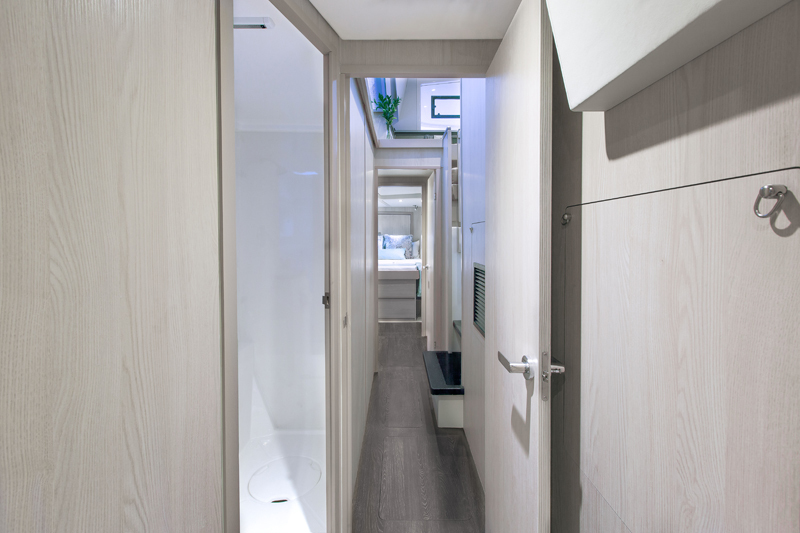 A highlight of the M514PC is the hydraulic platform off the stern that lowers beneath the water surface to allow the RIB to be launched and retrieved, and doubles as a wonderful swim platform when at anchor. 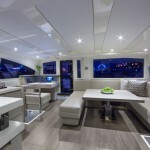 The saloon has 360-degree visibility and interior table for eight, a fully outfitted modern galley as well as a sit-down navigation station. 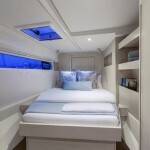 Below the main deck each hull has two full sized air conditioned staterooms with en-suite heads. 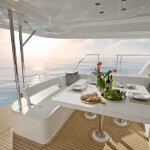 In the port bow there is additional single accommodation with head and basin that is great for a skipper/guide or cook. 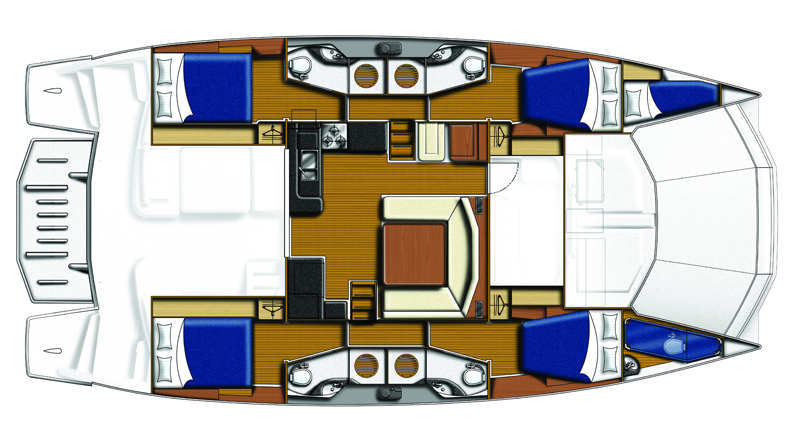 The New Moorings 514PC is truly the ideal way to explore the pristine waterways this yacht was meant to cruise on.